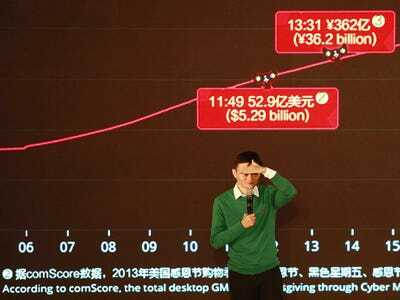 REUTERS/StringerAlibaba Group Executive Chairman Jack Ma gestures as he speaks to media and staff in front of a giant electronic screen showing real-time sales figures of the company’s Taobao.com and Tmall.com, on the ‘Singles’ Day’ online shopping festival, at the company headquarters in Hangzhou, Zhejiang province November 11, 2014. SINGAPORE (IFR) – Alibaba Group Holding <baba.n> sold the largest bond by an Asian company last night via a $US8 billion six-tranche offering. The tight pricing achieved on the deal led many to believe the US-listed Chinese ecommerce giant got away without paying a Chinese premium. “The pricing on Alibaba’s bonds did not reflect a China risk premium in our view, and was priced more like a US credit, given the solid demand from the US investor base and hype around the IPO,” said Raymond Lee, Sydney-based portfolio manager at Kapstream Capital, one of Australia’s largest fixed-income managers. Over the course of the 24-hour three-timezone bookbuilding, orders topped at US$57bn before settling at close to US$55bn. US investors anchored the trade by taking about three-quarters of the notes, two sources familiar with the transaction said. The company hasn’t disclosed the distribution statistics. “It is a defining trade not just for the sheer size, but the fact that it got priced against a peer group in a developed market,” said a person familiar with the matter. Alibaba bonds priced through some of the US blue chip tech giants such as Amazon <amzn.o> and eBay <ebay.o>. Its US$1.5bn 7-year tranche, priced at 115bp over Treasuries, came inside Amazon’s 2022s, quoted at a G-spread of 116bp. Its US$2.25bn 10-year, priced at 128bp over, also easily pierced through eBay’s interpolated curve. “The company achieved the tight pricing as it was clear in positioning away from China,” the person said. 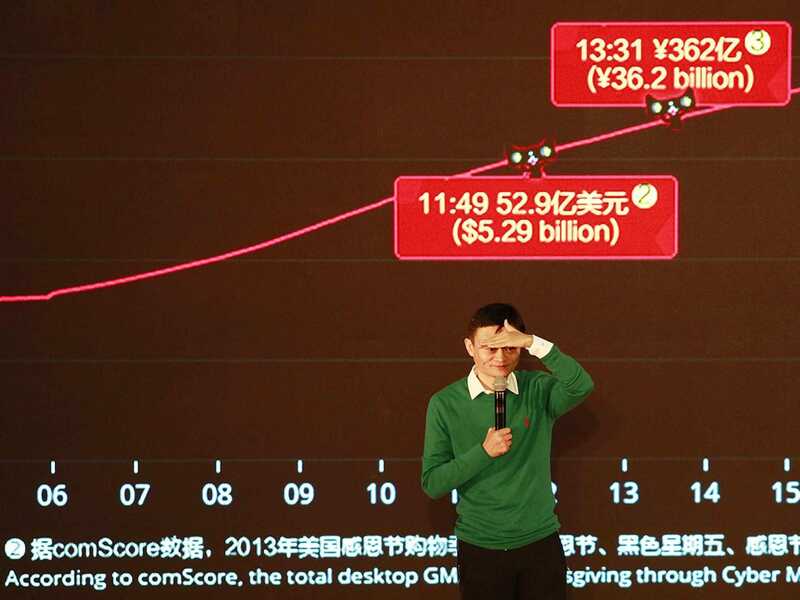 In fact, Alibaba’s three- and five-year tranches were priced 30bp-35bp tight to Chinese search engine giant Baidu Inc and 40bp-50bp inside the country’s web portal and social media leader Tencent Holdings. Asian investors, whose orders exceeded US$11bn across the tranches, were allocated a mere 15%-20% of the notes, the two sources said. Asian investors generally found Alibaba bonds expensive as they have many other Chinese credits that offer higher risk-adjusted premiums. According to a research note published by Nomura yesterday, Chinese credits typically pay a 20bp-50bp premium to their US peers due to the “China Discount” driven by the headline risk of the country and other technical factors. “For the Asian credit market, the Alibaba bonds are rich although they were priced fair for the US. Alibaba is a US credit (as it’s listed in the US and trades on US technicals) and unfortunately it will not provide the Asian market with a free-ride premium,” said Owen Gallimore, Singapore-based head of credit strategy, Asia, for ANZ. For those reasons, a number of Asian investors didn’t play in Alibaba. Instead, they bought Tencent and Baidu as they believed the Alibaba curve would make them look cheap, a third person familiar with the trade said. As expected, the Alibaba deal repriced the Asian tech space as the curves for Tencent and Baidu have been tightening since Thursday afternoon. Some funds also find better value in paper from similarly-rated Chinese state-owned enterprises. “We prefer to allocate our Chinese exposure to opportunities with better relative value like China National Petroleum Corporation, a AA rated government owned SOE, which priced their three year bonds almost 40bp wider versus Alibaba,” Lee said. The wholly state-owned oil major in China, rated Aa3/AA-/A+, priced a US$500m three-year tranche at 107.5bp over Treasuries, compared to Alibaba’s (A1/A+/A+) 70bp over. The US$8bn deal, to repay a syndicated loan of the same size, was split into US$1bn 1.625% three-year fixed-rate notes at 70bp over Treasuries; a US$300m three-year floater at 52bp over three-month Libor; US$2.25bn of 2.5% five-year at 95bp over; US$1.5bn of 3.125% seven-year at 115bp over; US$2.25bn 3.6% 10-year at 128bp over; and US$700m 4.5% 20-year at a spread of 148bp. The 20-year was a clear outperformer in the secondary market, tightening more than 10bp in the Asia morning. The other tranches were around par or a couple of basis points wider by early afternoon in Asian hours. Citigroup, Deutsche Bank, JP Morgan and Morgan Stanley were active bookrunners, with Credit Suisse and Goldman Sachs as the passive bookrunners. BNP Paribas, DBS, HSBC, ING, Mizuho Securities were co-managers.